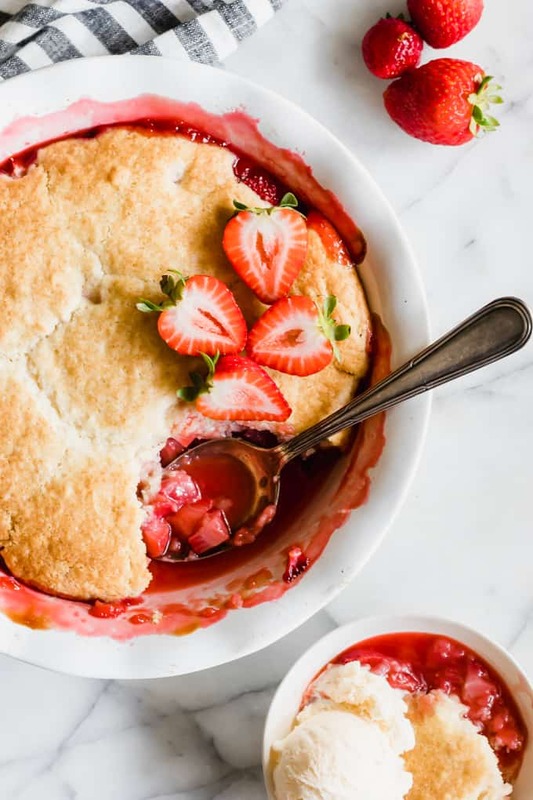 Strawberry Cobbler. 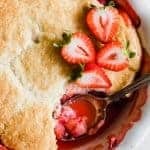 This easy to make cobbler is loaded up with fresh strawberries, and topped with a sweet, vanilla cake that gets a crisp crust on the outside and is soft and buttery on the inside. Top with some vanilla ice cream for the ultimate treat! Strawberries are my all time favorite fruit. 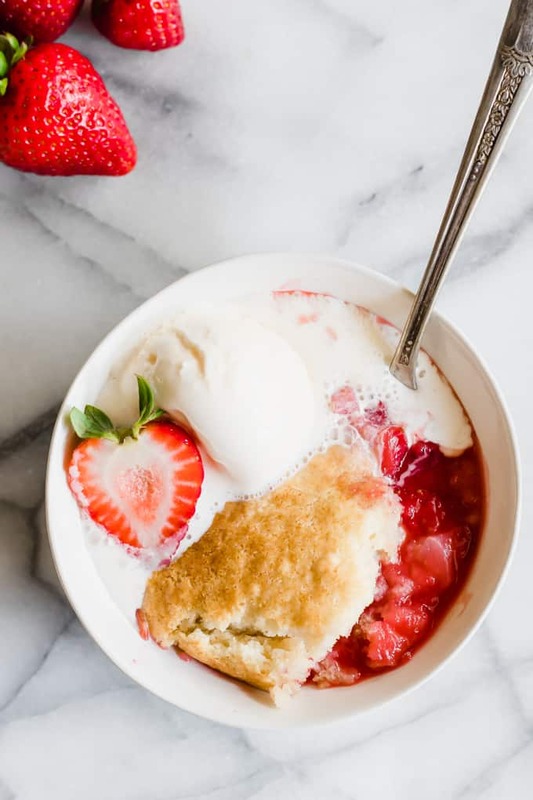 Which makes this Strawberry Cobbler is one of my favorite things to make every year! It comes together quick and easy too. 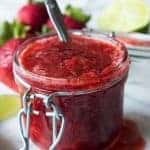 The strawberries are mixed with some lemon juice, cornstarch and a bit of sugar which creates that wonderful strawberry sauce on the bottom of the dish. And the biscuit topping is my all time favorite. It’s more of a cake than a biscuit. It’s so soft and buttery inside, but it still gets that crisp crust on the outside like a biscuit. 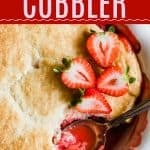 A cobbler is a dessert that has fresh fruit and a biscuit like topping. Since you drop the biscuit dough on top of the fruit it gives a cobbled appearance when it’s done baking. I like to use a 1/4 measuring cup and just spoon the batter on top of the fruit. 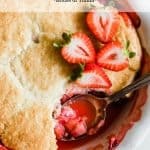 CAN I USE FROZEN STRAWBERRIES TO MAKE THIS STRAWBERRY COBBLER? Absolutely! Just set the strawberries in the fridge overnight to let them thaw. 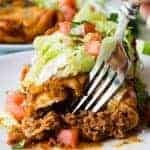 Then move ahead with the recipe. So if you have a ton of fresh berries on hand now you can always freeze them and use them later to make this recipe. 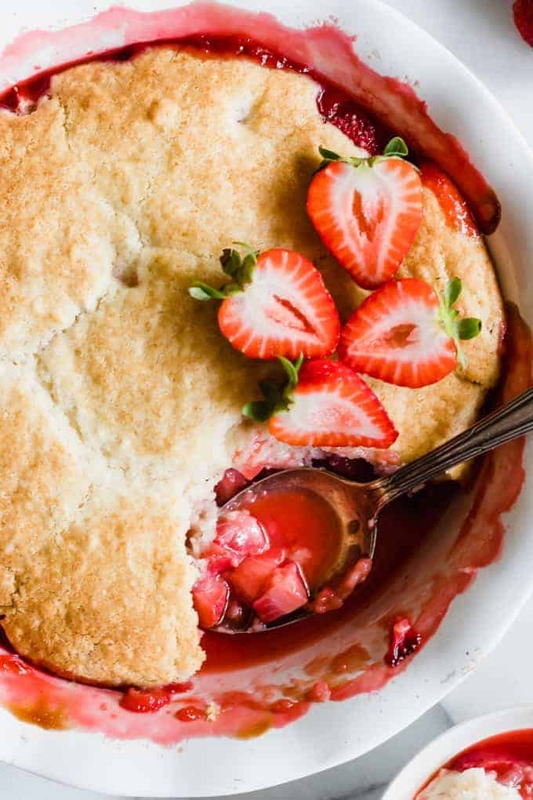 WANT TO TRY THIS STRAWBERRY COBBLER? 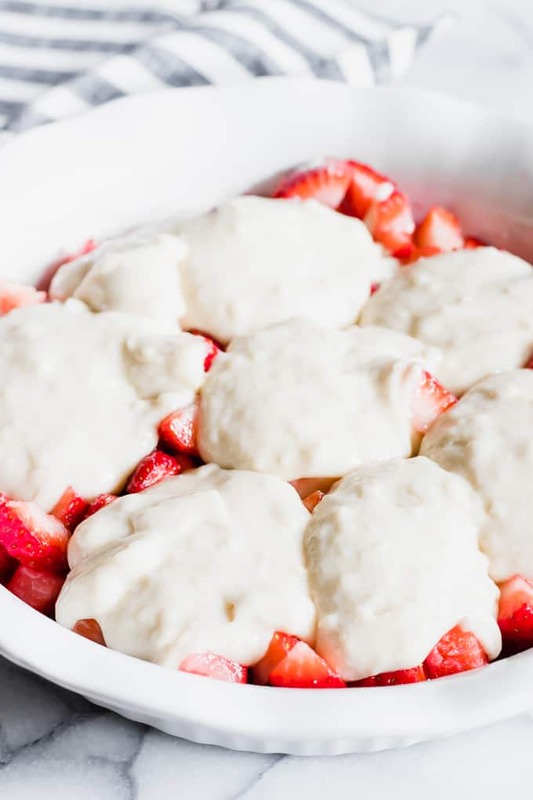 Add the diced strawberries to a 2 qt ceramic baking dish, or a deep pie dish. Add the sugar, cornstarch, and lemon juice. Stir to coat the strawberries in the mixture. Let sit while preparing the cake topping. In a medium size mixing bowl add the sugar, flour, salt, and baking powder. Stir to combine. 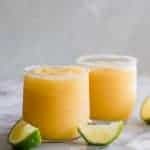 Pour in the milk, vanilla extract, and melted butter. Spoon the batter over the top of the strawberries. 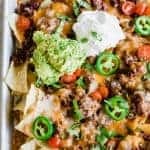 Bake at 375 for 35 minutes until the top is crispy and golden brown. 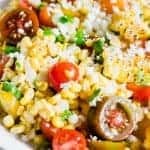 Serve cobbler warm or room temperature. Top with ice cream for a special treat!